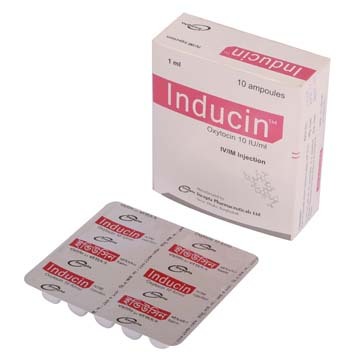 The active substance of Inducin is synthetically prepared Oxytocin, which is identical to the natural occurring hormone from the posterior pituitary gland. Oxytocin causes contractions of the uterus, thus mimicking contractions of normal, spontaneous labor and transiently impeding uterine blood flow. Amplitude and duration of uterine contractions are increased, leading to dilation and effacement of the cervix. Oxytocin also stimulates the smooth muscle associated with the secretory epithelium of the lactating breast causing ejection of milk out of the mammary ductular system but having no direct effect on milk secretion.Inducin has only minimal cardiovascular and antidiuretic properties. Therefore, it can safely be administered to patients in whom a (further) increase in blood pressure must be avoided, as in the case of hypertension, toxemia, (pre-) eclampsia, solution placenta and uremia. 3. As adjunctive therapy in the management of incomplete or inevitable abortion. Oxytocin is indicated to produce uterine contractions during the third stage of labor and to control postpartum bleeding or hemorrhage. 1.The standard solution for infusion of Oxytocin is prepared by adding the contents of one 1ml vial containing 10 units of Oxytocin to 1000 ml of infusion fluids. The combined solution containing 10 mU (1mU=0.001U) of Oxytocin/ml is rotated in the infusion bottle for thorough mixing. 2. The initial dose should be 0.5-1 mU/min (equal to 3-6 ml of the dilute Oxytocin solution per hour). At 30-60 minutes intervals the dose should be gradually increased in increments of 1-2 mU/min until the desired contraction pattern has been established. Once the desired frequency of contractions has been reached and labor has progressed to 5-6 cm dilation, the dose may be reduced by similar increments. 3. At term, higher infusion rates should be given with great care and rates exceeding 9-10 mU/min are rarely required. 4. Before term, when the sensitivity of the uterus is lower because of a lower concentration of Oxytocin receptors, a higher infusion rate may be required. 1. Intravenous Infusion (Drip Method): To control postpartum bleeding, 10 to 40 units of Oxytocin may be added to the bottle, depending on the amount of infusion fluids solution remaining (maximum 40 units to 1000 ml). Adjust infusion rate to sustain uterine contraction and control uterine atony. 2. Intramuscular Administration: 1 mL (10 units) of Oxytocin can be given after the delivery of the placenta. Intravenous infusion of 10 units of Oxytocin added to 500 ml of a 0.9% sodium chloride solution may help the uterus contract after a suction or sharp curettage for an incomplete, inevitable or elective abortion. Subsequent to intra-amniotic injection of hypertonic saline, prostaglandins, urea etc., for mid trimester elective abortion, the injection-to-abortion time may be shortened by infusion of Oxytocin at the rate of 10 to 20 mU (20 to 40 drops) per minute. The total dose should not exceed 30 units in a 12-hour period due to the risk of water intoxication. • Hypersensitivity to the drug may result in uterine hypertonicity, spasm, titanic contraction or rupture of the uterus. • The possibility of increased blood loss and afbrinigenemia should be kept in mind when administering the drug. • Severe water intoxication with convulsions and coma has occurred. • Oxytocin may occasionally cause nausea, vomiting, haemorrhage or cardiac arrhythmias, anaphylactic reaction. Oxytocin should not be administered in the following conditions: prematurity, borderline cephalopelvic disproportion, previous major surgery on the cervix or uterus including caesarean section, overdistention of the uterus, grand multiparity or invasive cervical carcinoma.